Milwaukee Ballet offers varied set of three dances with a boffo ending. 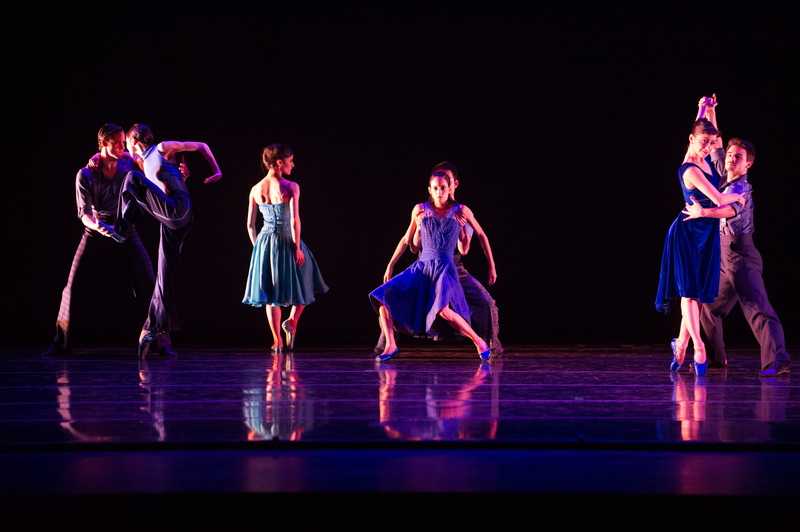 The Milwaukee Ballet’s “Spring Series,” performed this past weekend, might not have had the requisite weather outside, but inside Uihlein Hall at the Marcus Center we were treated to three diverse works from talented and renowned choreographers. The show opened with “In Passing,” a new work choreographed by Amy Seiwert and featuring music from Olafur Arnalds. 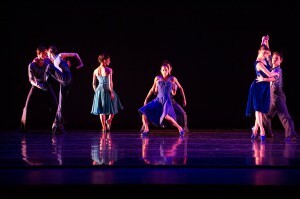 The stage was filled with soothing blue lighting as the dancers slowly emerged from each side of the stage—a duet would quietly grow into a group of six dancers, then scale back to three, then include all nine dancers for a moment before focusing on a duet again. Providing a subtle accompaniment was modern sounding string music that carried the dancers from one silky movement to the next. Something about the piece gave me the sense of watching the ocean—the dancers seemed to fold and unfold like waves, stretching out and then collapsing back in on themselves. Dancers partnered up and moved around each other with no space between, just sliding their bodies around each other before sweeping offstage. Near the middle of the performance, the music picked up and added a bass-heavy beat; the strings became a little more frantic and the lighting turned golden. For a few minutes the dance teamed with a different energy, keeping our eyes entertained with variety. Toward the final “act” of the piece, a dancer moved slowly at the back of the stage, wearing a train attached to her waist that stretched far behind her. She’d slowly tangle her leg into it, then step out of the trap just as easily. While it was interesting to watch, it felt anti-climactic; I missed the coming-and-going of the other dancers that had filled the first part of the piece. 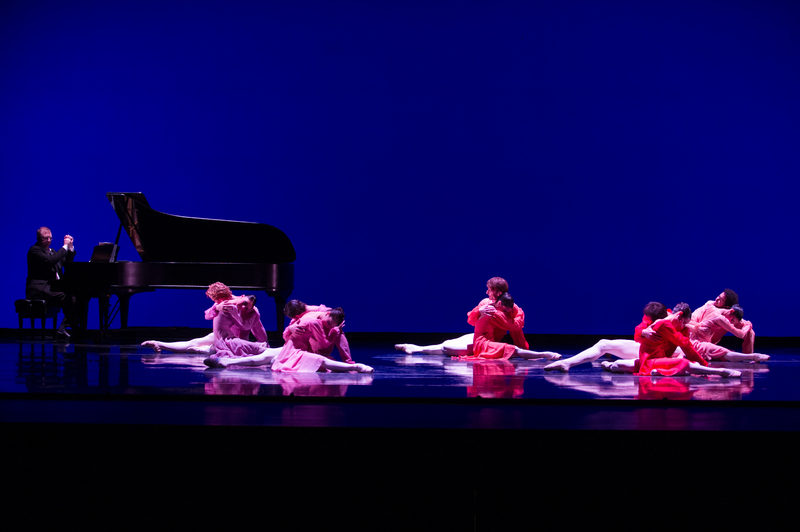 Vicente Nebrada’s “Our Waltzes,” a work created in 1976, came next, and embraced an old-world Latin aesthetic. Pianist Steven Ayers played Teresa Carreño’s composition live on stage. After the quiet and modern feel of “In Passing,” “Our Waltzes” took me slightly off guard. The piece opens with all 10 dancers, dressed in warm pastel shades and moving in a large circle. They flourished and chased each other, swooned and spun. Call me crazy, but something about all that smiling rubbed me the wrong way. The dancers were clearly instructed to beam at the audience, particularly after being lifted or completing complex steps. I understood that it was a classic piece, and a difficult one at that. The dancers paired off throughout the piece to perform varied duets that took them reeling around the stage, the men lifting the women as if they weighed nothing. But there was something about the momentum of a piece like “Our Waltzes” that felt repetitive rather than exciting. Each duet ended after a very obvious crescendo, and we applauded as the dancers smiled each time to the crowd. It did invoke a spring-like cheeriness, but perhaps tried to hard to get us there. Last was Matthew Neenan’s “Something Borrowed,” another work making its premiere, featured the charming music of Pink Martini. With a sort of 40’s-French-Singing-in-the-Rain vibe, dancer Alexandre Ferreira opened the piece, performing high leaps and acrobatic tumbles while the rest of the cast wandered a bit behind him. There were a lot of flexed feet and quirky hip-sways as we moved from song to song, and the dance never ceased to be charismatic. Of course, the songs themselves created that enchanting aura—Pink Martini can’t help but induce bluesy and cha-cha movements with their worldly, off-beat sound. Neenan created a flawless performance around it, embracing peculiar steps while maintaining a classic vibe. A duet between Ferreira and Luz San Miguel in particular showcased Neenan’s ability to choreograph something plainly beautiful and surprising. Also enjoyable were the sections where only the men were featured. At times they moved in unison, but more often were their own entities moving about the stage. Even the small gestures — when they scratched their heads and chests — grabbed you with their everyday familiarity. Meanwhile they could floor you with their athletic ability. And when the women moved back in to help close out the piece, moving their hips and sashaying to the sound, you couldn’t help but feel bewitched.